To debut their newest hiking boot, the Capra, Merrell was looking for something truly unique to celebrate the release of their most technically-designed boot to date. Tired of being thought of as the ‘brown boot company,’ the brand was looking for a way to not only regain relevance in the consumer’s consideration, but to simply make a splash in popular media as well. Our solution was Trailscape— arguably the first branded ‘walk-around’ virtual reality experience. Utilizing a VR headset and an array of motion-capture cameras, we created a virtual hike through the Italian alps that allowed participants to freely explore a CG environment by physically walking through it. Each step through the real world was mimicked exactly within the virtual one, giving people an extraordinary sense of presence. 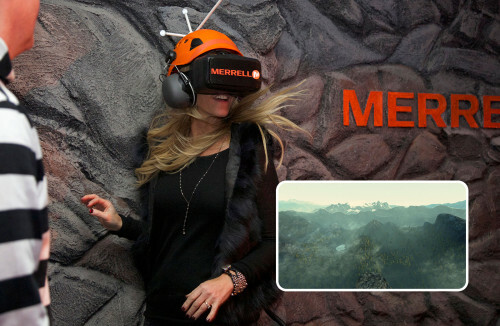 We debuted Trailscape at the 2015 Sundance FIlm Festival, partnering with Rolling Stone to create a venue that not only housed the VR experience, but also provided amenities to festival goers, an afterparty and junket space for filmmakers, and an interview lounge for RS’s Peter Travers. The event was a tremendous success, with unprecedented interest in the Trailscape experience leaving some hopeful participants returning day after day for a shot at traversing the alps. To prototype the experience, the team built out a full-scale mock-up of the VR pathway in a Brooklyn warehouse, allowing us to fully test the walking experience at the proper scale as well as to workshop the flow of a participant through the activity. The venue buildout took place over the course of a few days, transforming a Park City real estate office into the Trailscape lounge. 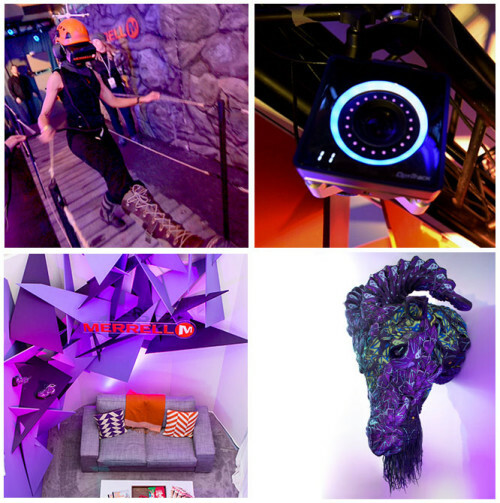 The venue was outfitted with custom-cut scenic design and lighting, amenities like charging stations and bars, and of course the VR installation itself. The crown jewel of the Tailscape scenic design was an 8-foot-tall goat head constructed entirely out of the new Capra boots and shoes. Through our partnership with Rolling Stone, we also accumulated a great repository of celebrity interview content from within the venue as well as coverage of our live show with Local Natives and interviews with participants in our VR experience.